• NEW! Parking brake (locks wheels and provides safety during loading/unloading) located at both ends of cart. 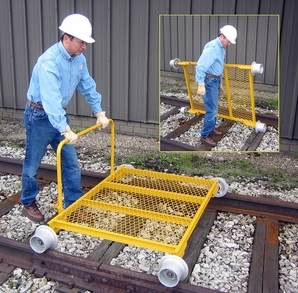 • Can be custom-built for a specific track gauge. Product Reviews for Nolan TS-1-116B One-Piece Tool and Supply Cart, Steel Body, 5" Aluminum Wheels 1,000 Lb Cap.